A very common question we face from our customers or interested parties is whether or not our electric combi boilers are cheap to run? Interests also ask us how do you compare electric boiler and gas boiler running cost? We all know that the unit charge of gas is cheaper than electricity. It is a misconception that gas boilers are cheaper to run as compared to electric ones. 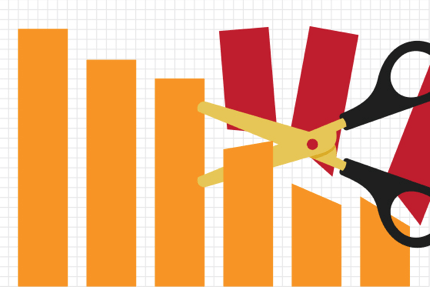 Let us brief you and explain, how close the running cost is between gas boilers and electric boilers. There are factors which people ignore when they compare a gas boiler setup with electric boilers. For example, the yearly gas certification cost, carbon monoxide detectors and their yearly maintenance. More importantly, the repairs cost on the gas boilers are something which can be very expensive at times. We all know that gas is cheap per unit, however the boilers burn and waste a lot of gas which one shouldn’t pay initially. 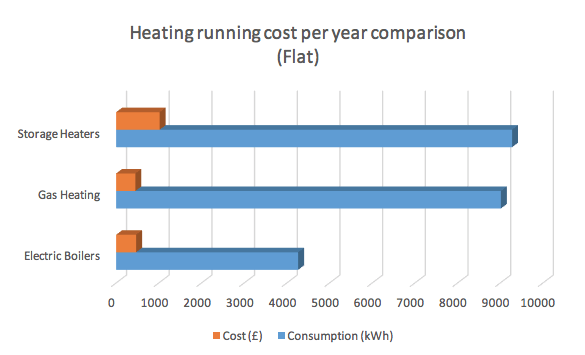 If you consider the above costs with your yearly running cost, then electric combi boilers are cheaper to run per year. Let us evaluate our electric combi boilers in terms of running and maintenance costs. Our range of 12kW electric combi boilers are modulating from 2kW-12kW. Once the temperature reaches the desired setting set by the user, the boiler modulates to 2kW, hence saving monies on energy bills. The boiler only comes on when there is a demand for hot water and since there is no storage (Elektra C only) there is no loss or waste of energy as compared to storage cylinders and gas boilers with tanks. Our electric boilers are maintenance free as long as you have a filter on the central heating circuit and limescale reducer in cold inlet to the boiler. Electricity is expensive per unit compared to Gas. However if you see the usage per year compared to gas it is less than half of gas usage with our Electric Combi Boilers. 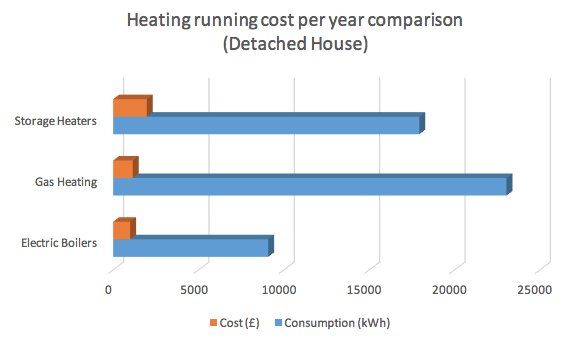 The running cost is almost at par running a Gas boiler with our Electric Combi Boiler. You also save money on yearly maintenance and repairs as compared to gas boilers. There is no carbon footprint left by our range of Electric Boilers (product). If you do not have gas at the property or are thinking of enhancing gas property with forward thinking heating system, this product is best suitable for new build, flats and houses.